Will the straightneck squash climb a trellis, so I can harvest them easier? I'm in a wheelchair. Straightneck squash is a summer squash, which doesn’t tend to spread like the winter vining varieties. However, you can still place a trellis or similar structure next to the plant if needed. 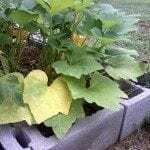 You may also want to consider growing your squash (or other plants) in raised beds as well.